Evening for Parents/Carers at the Pre-school. We are now an ECAT Setting - “Every Child A Talker"
Thank you for considering Streatley Hill Pre-school for your child. Our aim is to provide a safe, happy and stimulating environment that encourages learning through play for children aged 2 to 5 years. Our thanks to the local community! We have a beautiful new pre-school building! The larger, lighter, brighter and airy building has space for a maximum of 20 children to attend each session. 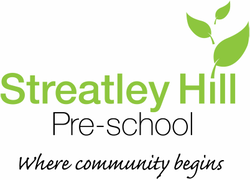 Please call 01491 875247 or email lt1streatleyhillpreschool@gmail.com for more information. During the holidays and out of office hours, please leave a message or send an email and someone will contact you as soon as possible. Click here to see our latest (March 2015) Ofsted report.